This 14-lesson comprehensive manual for foreign language interpreters is the result of 20 years of teaching, consulting and collecting feedback from users of our two former editions. 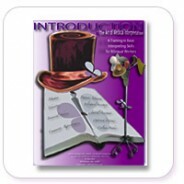 It is designed to support educators and trainers in teaching linguistically qualified adult learners. The manual was carefully developed by a team of bilingual educators, interpreters, providers, interpreter managers and legal consultants with specific knowledge of Title VI and HIPAA. It elicits students’ knowledge as individuals and encourages reflection through critical thinking exercises which guide students through an incredible journey of enhancing knowledge, developing key interpreting skills, as well as a great understanding of both ethical and cultural variants in the real life triadic encounter. Through over 90 role-plays and case studies, body diagrams, matching exercises and quizzes, students will apply tools to facilitate interpreting skills, as well as to develop a basic understanding of main body systems, common medical procedures, common illnesses, different types of pain, immunizations and medical professionals, while expanding their knowledge on medical terminology. For an additional fee, CCCI/CCCS, Inc.™ is available to consult future trainers on how to use the manual, on curriculum development and rubrics. 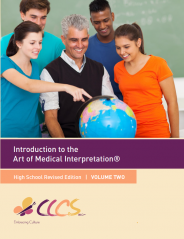 CCCI at CCCS, Inc.TM has developed the Introduction to The Art of Medical Interpretation® – High School Edition Vols. I and II manuals and two-year program of study so that bilingual students can develop skills today that will allow them to pursue healthcare interpretation as a future profession or as a professional anchor as they work their way through college. 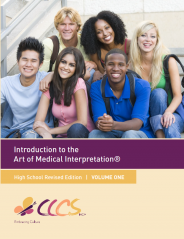 For more information on the Introduction to The Art of Medical Interpretation® – High School Edition manuals and two-year program of study, contact us by email or telephone at 888.678.CCCS x105. For more information on the Introduction to The Art of Medical Interpretation® – High School Edition manuals and two-year program of study, contact us by mail or telephone at 888.678.CCCS x105. This manual was designed as part of a 54-hour basic interpreter training program for bilingual health care staff. 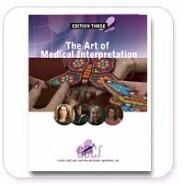 Basic medical interpreting techniques are explained and commonly faced ethical issues are presented in role-plays and case studies. The manual’s body system summaries and illustrations expand the reader’s understanding of common illnesses, and vocabulary-enriching exercises assist bilingual healthcare workers to build upon their existing knowledge of English and target language medical terminology.